I have a theory about why Americans downplay their culture of hugging when living as expats in China. In the US, it is customary for female friends who are close or who haven’t seen each other for a long time to hug as greeting or farewell; the same is true between a male and a female friend.Â (Male friends shake hands. )Â Friends who are not close, will usually wave or say hi; in more formal situations they may just shake hands. In the 2 years I’ve been in China, I’ve noticed that American expats whether in Beijing, Shanghai, or elsewhere have completely abandoned this cultural norm. Americans have adopted the practice of kiss-kiss, or kissing the air while touching first the right cheek then the left cheek. Two girls, and a girl and a guy will do it.Â (Two males continue to shake hands.) They don’t even need to be close friends, mere friends or familiar acquaintances are given over to the kiss-kiss greeting. 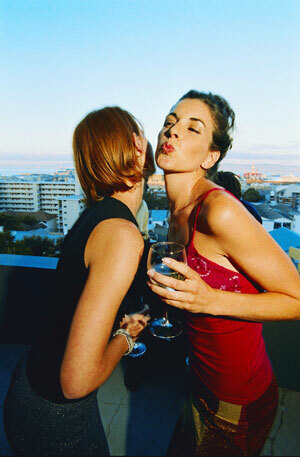 This kiss-kiss greeting is common in Latin American culture and European culture.Â Notably, French and Italians do 2 kisses, while Argentines and Dutch do 3. I, as an American expat in Shanghai, have become accustomed to doing the kiss-kiss greeting and farewell to such an extent that when Americans who are in town visiting hug me I am shocked and feel somewhat uncomfortable. Anyway, on to my theory…Â My theory is that, largely due to the current administration, because Americans are so hated abroad, we try to diminish our American-ness by adopting other cultural styles.Â We try to make ourselves seem less American by acting like Europeans or Latin Americans.Â We attempt to show that we are citizens of the world and embrace other cultures by adopting them as our own, rather than beating them down, much as has been done in Afghanistan or Iraq.Â Obviously, this more of a necessity and common practice in expat life since daily we seek to be accepted by associates and friends from around the world who are frequently not fond of America.Â As expats, we are attempting to minimize our American-ness in the presence of a global community and seek acceptance among our kiss-kiss-accustomed peers. I’m curious to know, if this is just a phenomenon of expats in China, or if this happens among American expats elsewhere in the world.Â Comments on the expat experience elsewhere and agreements (or not) with my theory are welcome. As far as whether I like the practice, in some ways I do, as it feels refreshing and somewhat less awkward than the standard American hug.Â However, sometimes I do miss the benefits and closeness of a hug. Interesting sociological observation. Perhaps this is because there is a large contingent of Europeans in China and the Americans are forced to adapt to the cheek-kiss culture. The double or single air kiss is a NYC thing too, at least between male and female friends. But New Yorkers also tend to play down their American-ness. â€œThe Tragic Kingdom or; Prisoner in a Chinese Theme Parkâ€, (found on most book dealer websites; Amazon, Barnes and Noble etc), is a behind-the-scenes look into the field of design and build in China. The book is a profile of the personalities, culture, and psychology of the worldâ€™s most massive looming superpower as seen through the eyes of an ex-pat American. â€œI have lived and worked in China for over ten years, competing within their system, making my way as everything from a freelance artist in small operations to a senior designer for large corporations. I have witnessed a formidable decade in which China has commanded a modern presence on the world stage. I have participated in the planning, designing, and building of mega-theme parks in Beijing, world-class aquariums in Shanghai, gigantic malls in the Pearl Delta, resorts in Tibet, and panda relocation projects in the foothills of the Himalayasâ€. The true stories and themes found in The Tragic Kingdom, spring from one manâ€™s journey. At the same time they disclose truths about a globalization that eventually will impact every economy, lifestyle, and person on the planet. China, like the USA is a very large country with, perhaps different groups and local culture amongst minority groups (here in China that being westerners). I can say I have never seen two Americans kissing or “air-kissing” for a greeting here in Guangzhou in the last 3 years. One time a female European did that to me as a greeting, and I was literally stunned why someone was touching me (seemingly an American norm, at least where I am from in the Mid-west. Likely certain regions of the USA may be more apt to “touch” each other (I’m guessing more metro/cosmopolitan areas like NY, or CA) by hugging or whatnot, which may then carry over here into their expat culture. Ultimately I can only speak for myself of course, and same as in the USA, where I don’t touch people except an occasional handshake, nor do I here and I just haven’t seen it amongst other westerners other than those I know to be 2 Europeans. Perhaps it’s a latitude thing more common with “Northerners” such as IN the Beijing/Shanghai region you mentioned.